This provocative and original book challenges the commonplace that contemporary international interactions are best understood as struggles for power. Eschewing jargon and theoretical abstraction, Mervyn Frost argues that global politics and global civil society must be understood in ethical terms. International actors are always faced with the ethical question: So, what ought we to do in circumstances like these? Illustrating the centrality of ethics to our understanding of global politics and global civil society with detailed case studies, Frost shows how international actors constitute one another in global social practices that are underpinned by specific ethical commitments. The use of Private Military Companies. Global Ethics forces readers to confront their own necessary ethical engagement as citizens and rights holders in global society. Failure to understand international relations in ethical terms will lead to misguided action. 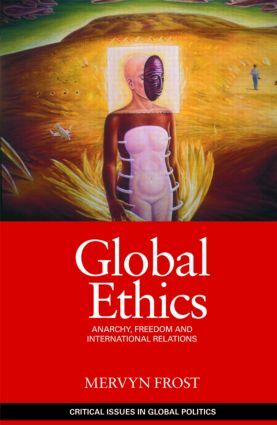 This book should be read by all scholars and students of international relations as well as the general reader seeking an accessible account of the importance of ethical decisions in world affairs.